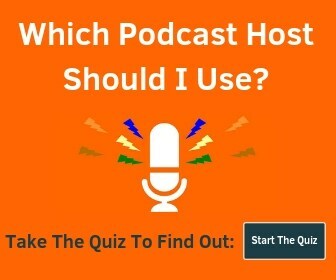 Many people who want to get started podcasting think all they need is a decent microphone to started. While that’s mostly true, you need a way to get the microphone into a good position in front of your mouth as well. If you plan on using a shock mount, you will need a microphone stand in order to attach the mount as well. There are tons of different options when it comes to microphone stands: boom arms that attach to a desk, floor tripod boom arms, built-in mic stands, tabletop desk stands and more. We’re going to take a look at the best tabletop desk stands to hold your microphone. These are more portable and less expensive than a larger boom arm. 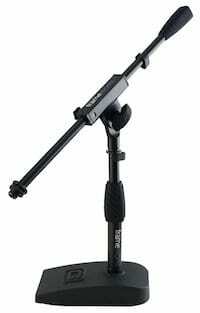 The prices for these mic stands range from under $15 to about $60. Basic but gets the job done for cheap. 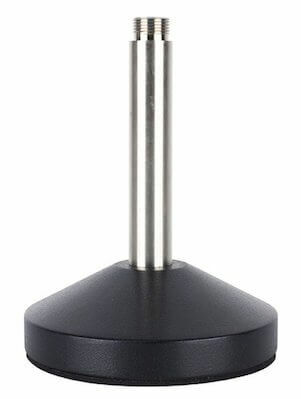 The On Stage DS7200B has a 6″ base that weighs 2 pounds and has an adjustable height. It uses a standard 5/8″-27 thread and is made out of die-cast steel. You can get it in either black or chrome (DS7200C). Quick tip: If you plan on recording video, the chrome can be distracting, so I would go with the black one. My previous recommendation seemed to have disappeared. 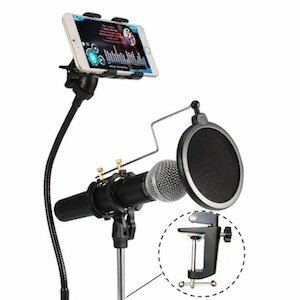 This 3-in-1 cellphone stand/mic stand/pop filter is a nice combo and will work well with larger phones, although I wouldn’t try to use it with heavier mics. The Samson MD5 is a pretty basic offering for a tabletop mic stand. The height isn’t adjustable, but you do get a solid and heavy stand. The Heil CB-1 PTT includes a switch for push-to-talk or push-to-mute along with a 2-foot cable to make that feature work. Leo Laporte used this stand. Uses standard 5/8″-27 threading. The polished chrome accents give it a nice premium feel. 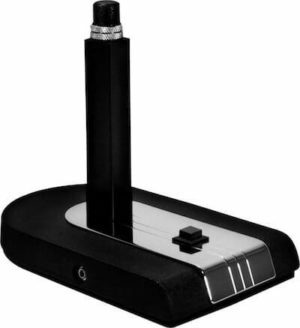 MXL is known for making great quality microphones and the MXL DS-03 microphone desk stand fits right in. Fairly simple design, but it gets the job done. Used on the Dan Patrick show. I’m a big fan of the Proline MS112 floor or tabletop stick boom design. The boom adjusts from 1″ to 9″, height adjusts from 12″ to 17″ and it includes a cable clip to keep things tidy. 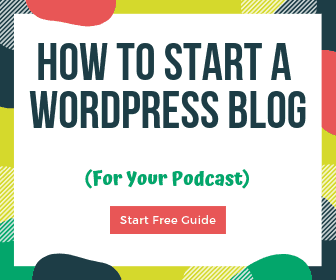 You could use this to record a podcast, bass drum, amplifier and more! 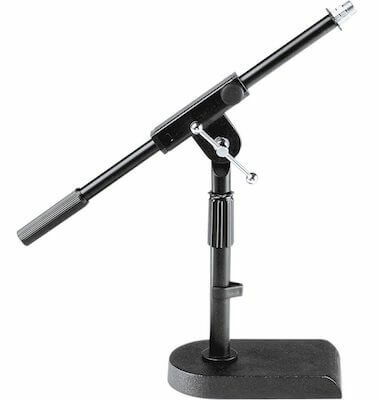 Here’s a nice desktop mini boom stand from Gator Frameworks. The max height is 23″ and the boom section is 16″ long. This also comes with cable clips and is well-built. Great option and costs less than some of the other small boom-style stands. 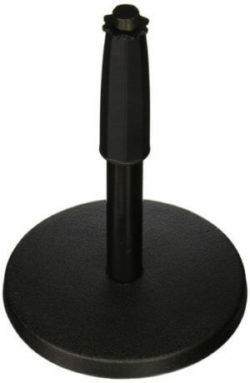 Rode is another quality microphone brand and this desk stand is no exception. 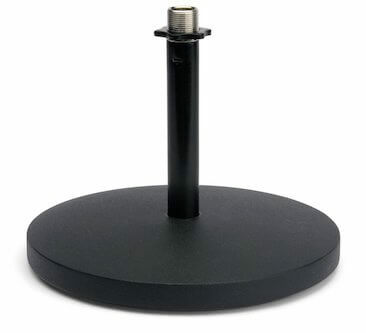 The DS1 Table Top Desk Stand is another solid choice. Comes with cable routing clips. 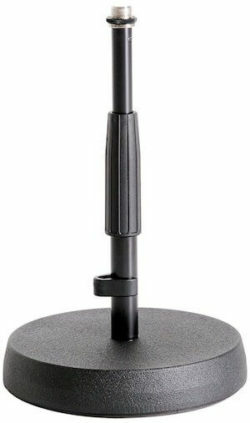 The K&M 23325 Microphone Stand is height-adjustable, comes with a cast-iron base and an anti-vibration rubber insert to help keep unwanted noise out. It also comes with a cable clip. It is expandable with the K&M Microphone Bar to hold 2 mics. Lastly, we have a cross between a full boom and a desk stand. Some people call it a “stick boom”. As you can see in the image above, the Heil SB-2 uses a vice mount that attaches to a desk. The stand fits into a hole in the top of the mount. The benefit of this is that it allows the boom to rotate 360 degrees. 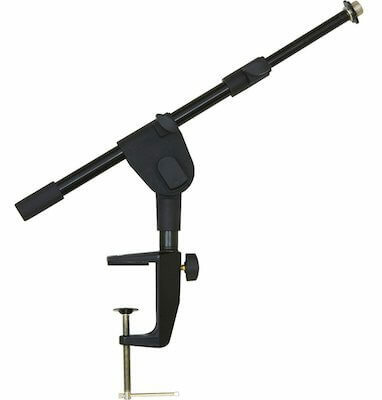 Heil also sells more permanent wall and desk mounts that work with this and with their larger boom arms like the PL-2T.